The reason was that one of the platforms five legs broke away. 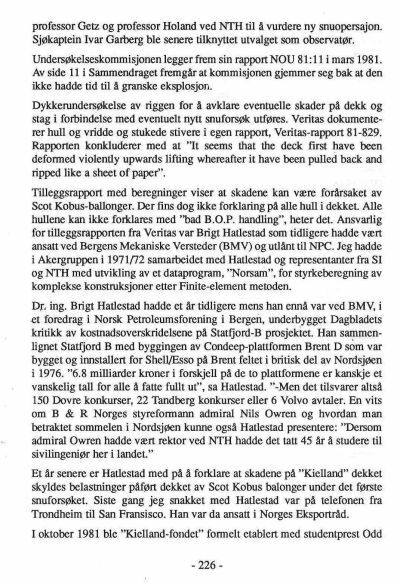 First uprighting attempt of "Kielland" failes in summer 1980. 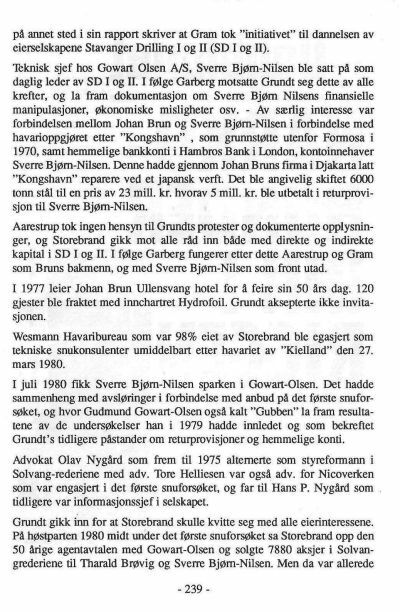 Feb. 1981 Gro Harlem Brundtland (Labour), the daughter of Gudmund Harlem, close connected to Jens Chr. 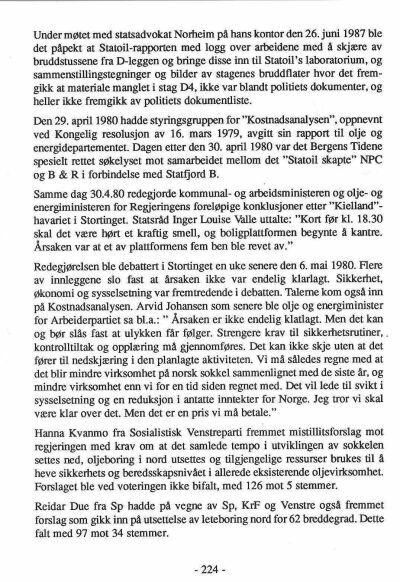 Hauge (first chairman in Statoil) takes over as Prime Minister after Oddvar Nordli (Labour). whereafter the D-leg is pushed away and the deck falls down. 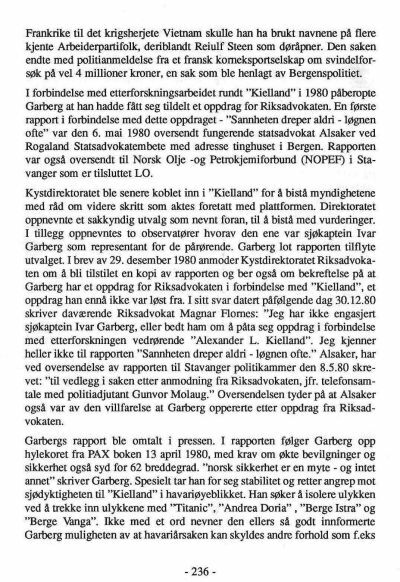 the report does not deal with explossion accidents. 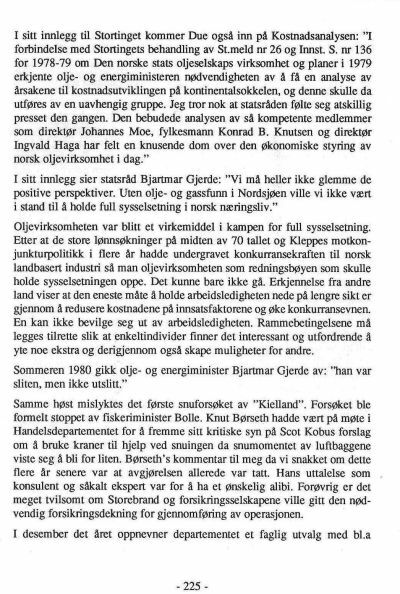 Kari Gjesteby, Minister of Trade in Gro Harlem Bruntdlands (GHB) cabinet advocates against a new uprigting attempt. Sept. 1981; General election and change in Cabinet. Kaare Willoch (Conservatives) commences his duty. 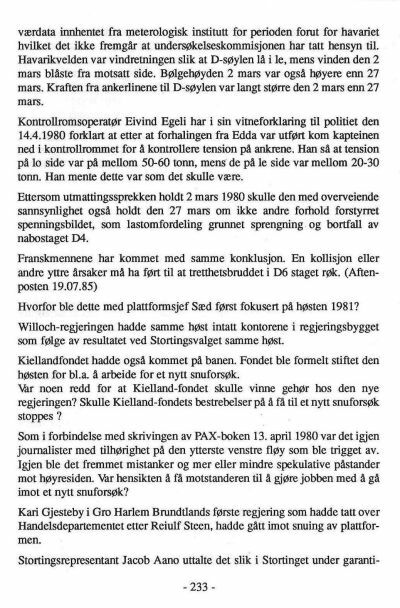 The "Kielland-Foundation" representing relatives and survivors is established in Oct. 1981 advocating for a new uprigthing attempt to take place. The knowledge about the fatigue cack in bracing D-6 prior to the capsize is investigated. 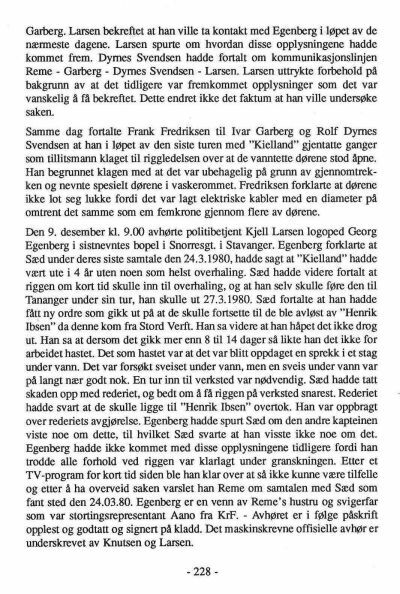 Platform Captain Sæd (perished) had performed inspection as planned Jan/Feb 1980. He reported on damages on the rig. 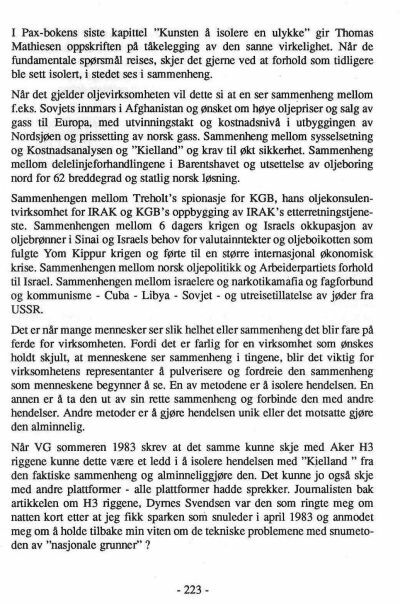 This was confirmed in witness hearings Nov/Des 1981. 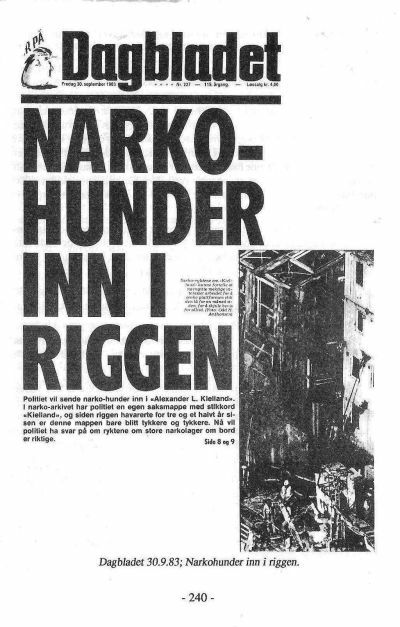 The cause of the disaster was believed to be the fatigue crack, and this information was sensitive to DnV and others who likely had been contacted in assessing how critical the crack was in the keeping of the rig in operation at the Ekofisk field in March 1980. Gross negligence might show to have taken place? Facts to day proves otherwise! The French builder stated the rig would not collapse unless something else had happened in addition to the fatigue crack as f.i. ship collision. 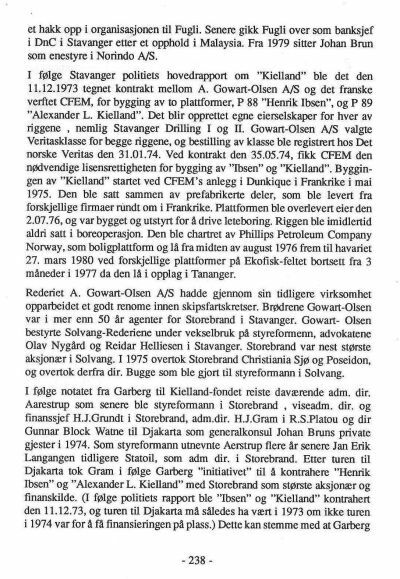 Mr. Borseth who inspected the rig with me in Oct. 1983 presented calculations showing that if the fatigue crack was the only reason the rig should have collapsed on March 2nd 1980, due to the more severe weather that day. 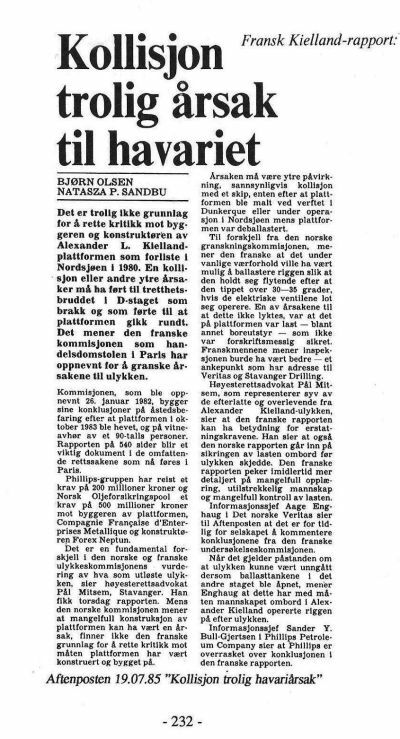 The smartness in spreading the word about the pre-capsize knowledge of the fatigue crack succeeded. 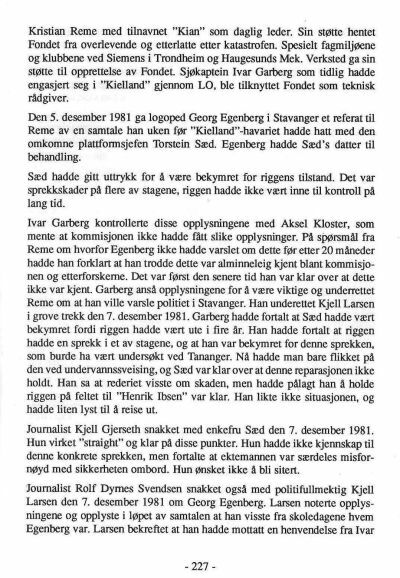 The "right wing" politicians were driven into the "fire ditches". 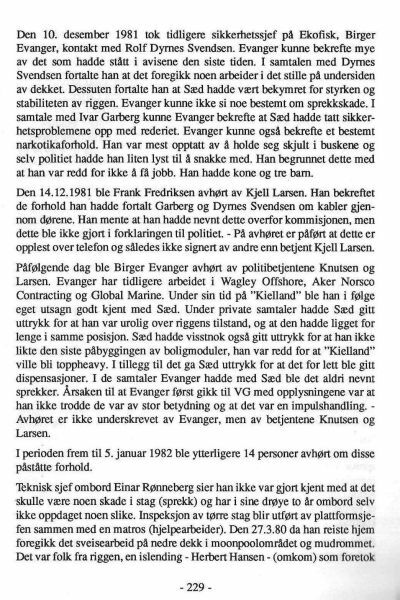 Seacaptain Ivar Garberg (leftist) had involved himself in selling corn from France to the after the war devastated Vietnam. 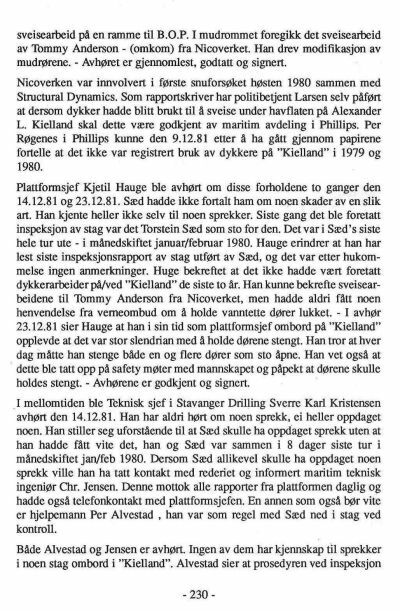 He was early engaged in "Kielland" attacking shipowners and conservatives for negligence. 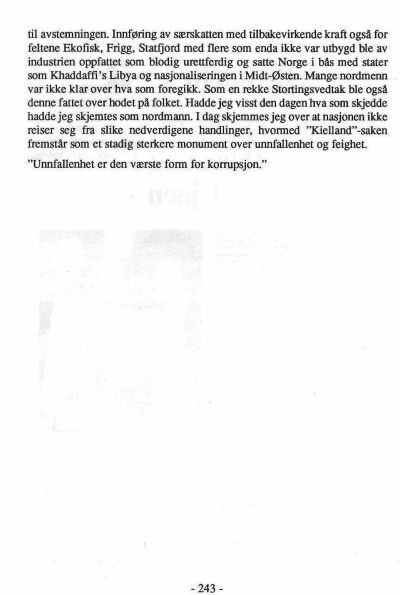 However, in his notes about "Kielland" he divulge the relationship between many of the backplayers. 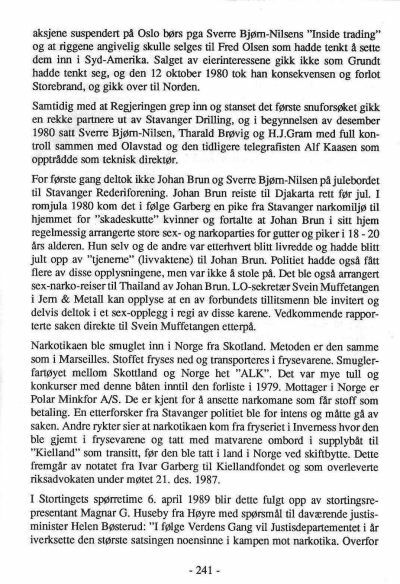 The narcotic trade beween Scotland and Norway. 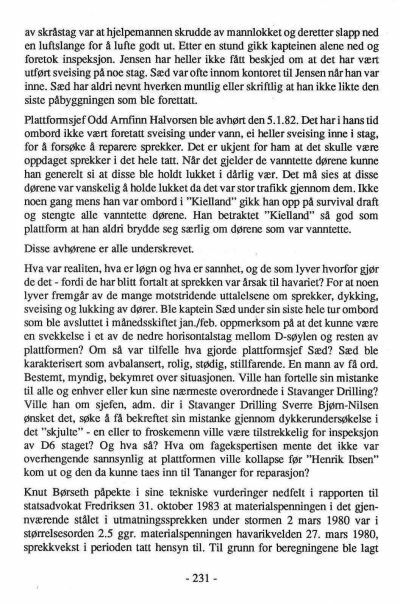 The use of "Kielland" as transit platform. 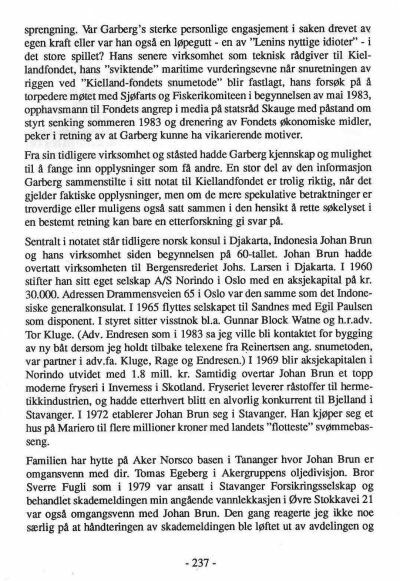 Johan Brun's involvement in the refrigeration plant in Inverness. 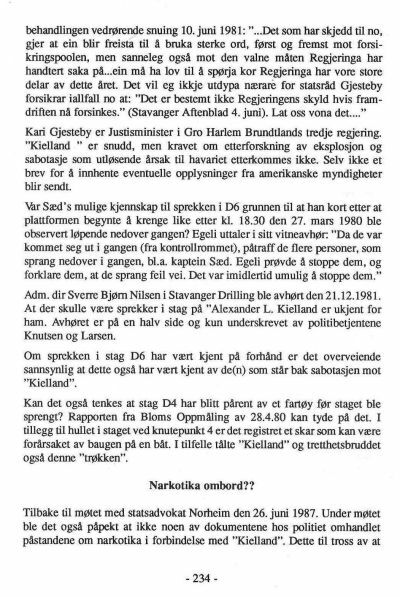 The transfere of narcotics in the catering. The catering run by Dolphin Services and B&R Norge. 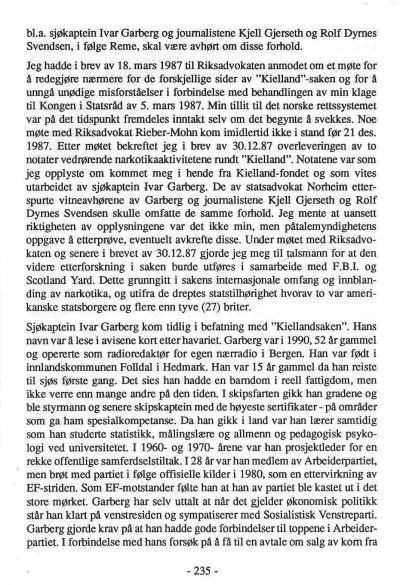 In late 1960-ties Thorvald Stoltenberg (labour) remained in position within the Foreign Ministry under John Lyng (conservative) as advisor on Vietnam. 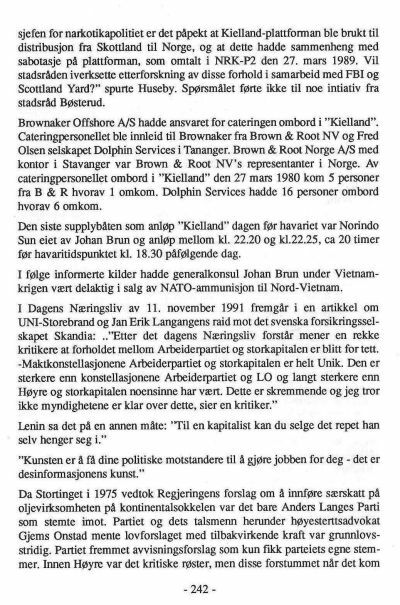 when "Kielland" capsized on March 27 1980.
the manufacture of NATO ammunition in Norway.